Welcome to our Emboss It! 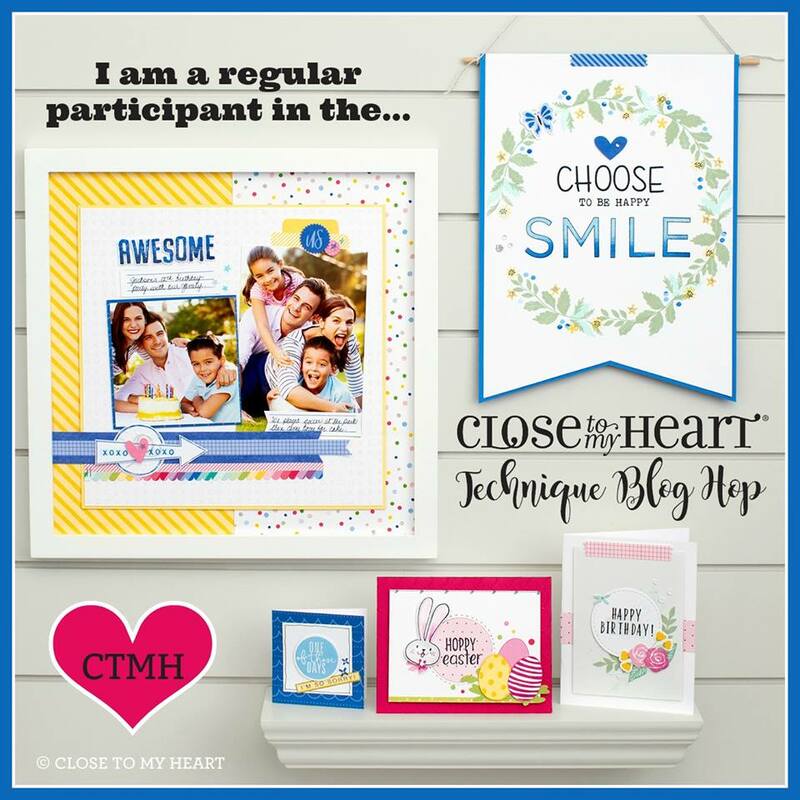 - CTMH Technique Blog Hop! 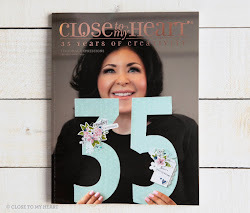 All of the beautiful creations you see will be featuring the different creative ways you can use Close To My Heart's Embossing Folders and Embossing Powders. If you have come here from Lauren Moore you are on the right path! The blog hop is a great big circle, so you can start here and work your way all around. If you get lost along the way you'll find the complete list of participating consultants on Melissa Robinson's blog. 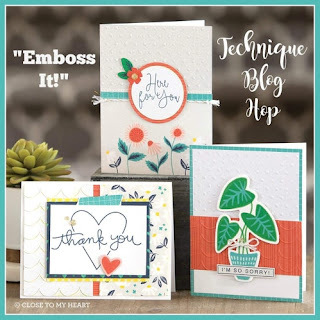 For this blog hop we have 9 Close To My Heart Consultants sharing their creations using the Embossing products and other great CTMH products on their blogs. 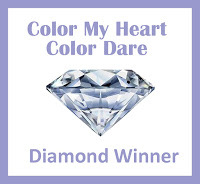 This is simple to do~just click on the link at the end of the post on each blog to move to the next one! I made this card using the Embossing Folder called Playful Scallops. 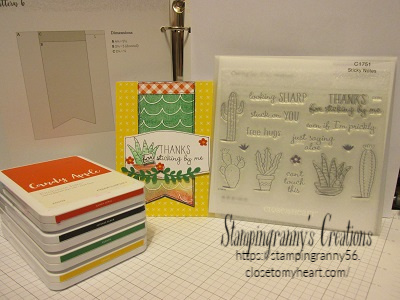 Using the stamp pad, I smooshed the three different colors on the embossing folder with each stamp pad stacking the three colors (Candy Apple, Clover and the Canary) next to each other. Then I put a piece of White Daisy into the embossing folder with another piece of cardstock for a shim and run it through the embossing machine. Voila! The ink was transferred to the White Daisy in a very interesting way! I cut it to the size I needed and doodled around the edge with a black journal pen after dovetailing the bottom. Added the trim to the top. I adhered this piece to a piece of Sapphire and hand trimmed around so just a tiny bit shows. Makes it pop off the page. I cut the White Daisy sentiment from the Cricut. Stamped the designs from the stamp set called: Sticky Notes fussy cutting a tiny square for the word for, fussy cutting one of the flowers to pop it off and the leaf vine came from the Cricut. I used the Intense Black to stamp the designs on with and then water colored with the inkpads. You can use watercolors or markers to color in instead. Love these colors! They are part of the color line up of the March Paper Pack called Falling For You. The background paper on the card and the trim on the banner are from that paper pack. I used the pattern for the card in the Make It From Your Heart-Vol. 4 Pattern 6. Now "Hop"on over to Carrie Simonds to see her works of art! Be sure to visit all the Consultants at their Blogs to get some great crafting ideas and other fun ideas! Contact your CTMH Consultant ( or click here ) to get the products I used for this project! So pretty! 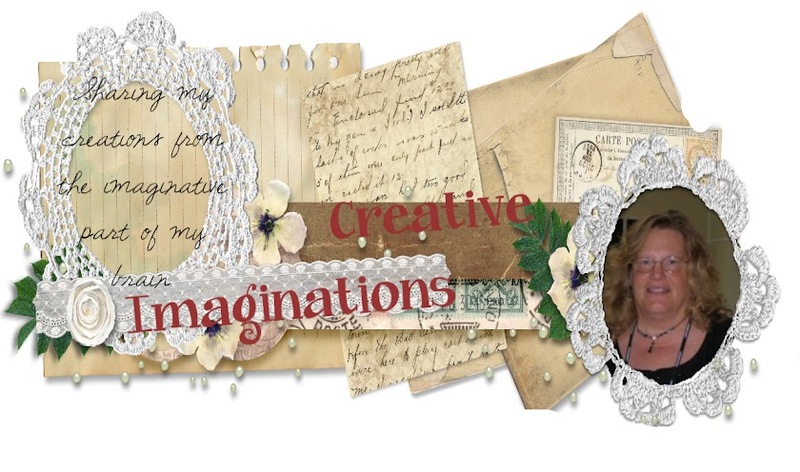 I love different colors on the scalloped banner! Contact me to get yours today!!!!! Take time to scrapbook, stamp, make cards or whatever you want to do and come and go when it suits you. This is your time to get those projects done!